First there was the bagless vacuum cleaner, then the towel-less hand dryer: Now James Dyson, the British inventor, has developed a bladeless electric fan which goes on sale on Tuesday in the US and Australia. The Dyson Air Multiplier fan – which looks like something straight out of a sci-fi movie – uses advancements in airflow engineering instead of traditional blades to ‘multiply’ air 15 times and push out 119 gallons of smooth and uninterrupted air every second. 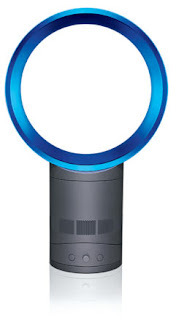 As a result, Dyson claims the bladeless fan, which works by forcing a jet of air out of a narrow circular slit and then over an aerofoil-shaped blade, is at least as efficient as its bladed counterpart, more comfortable and much safer. Not sure there’s a lot of pent-up demand for better fans, but it’s a neat invention nonetheless.